When Mary turned fourteen, according to the legend, the High Priest ordered her to leave the Temple and find a husband. She had expected to be able to devote her life to prayer. Neverthleless she was the most beautiful of the eligible females, and had numerous wealthy and handsome suitors. Joseph alone, a late middle age widower, did not compete for her hand. When he was required to do so, he miraculously won the contest of the rods and the hand of Mary. 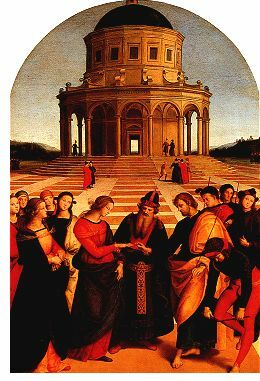 The loveliest of all the marriage ceremonies is Raphael's Lo Sposalizio (The Betrothal). Though it owes something to Raphael's teacher, Pietro Perugino, it shows how far the student had moved toward assimilating the lessons of the Florentines. Mary is tall and beautiful, and Joseph is rather distinguished. Note the disappointed suitors, one of whom is breaking his rod. The stunning tableaux in the foreground and the gorgeous harmony of palace in the background set up a space which allows the figures a wonderful freedom of movement. The vision may seem more like Athens than Nazareth but it surely is intended to suggest the ideal harmony between man and woman and citizen and city. In such a place one could be happy.